Posted on July 2, 2014 by Sarvjeet Singh. “Tumhare shorts kaafi short hai…Tum yahan logon ko excite karna chahti ho?” This dialogue from Krish to Ananya is one of the very few instances of overt sexism in 2 States. There are no scantily clad women dancing in item numbers here. Instead, we get a strong female lead, and witness the breaking of a couple of good old patriarchal stereotypes. Yet, for all this, 2 States lacks proportional female representation, and is essentially a male centric movie. The movie scrapes a pass on the Bechdel test, with the four named and speaking female characters talking to each other fifteen times, six of those times being about something other than a man. However, each one of those six times was under a minute, always in the presence of a male character, and usually about marriage and the clash of cultures that the conflict in the movie stems from. The movie reinforces an old trope about women, one that we may call ‘The Overly Attached Mother’, who is embodied by Krish’s mother, Kavita. Near the beginning of the film, Kavita asks him why he had to go so far away to study. She also continuously refers to Ananya as having trapped or caught her son, as though she is afraid to lose him to another woman. She reinforces gender roles when she comments that a daughter-in-law is supposed to be respectful, and that they are supposed to be kept on the ‘edge of a knife’. Moreover, she becomes offended that the bride’s mother met her, the bridegroom’s mother without a gift, as though the groom’s family is superior to the bride’s and sulks about the same until she receives her share of presents! Krish’s interactions with Kavita constantly bring out the motherly side of her character. When she is angry with him, he coaxes her by saying that he told Ananya how much care Kavita took to raise him and how beautiful she is. This attempt to please her further reinforces gender stereotypes about the worth of women in society; it tells us that women are valued mainly for their good looks or care giving attributes. Krish also dominates his mother to some extent. When he calls her at the beginning of the movie, he berates her for forgetting to keep her phone with her, and his tone is one of irritation. This reinforces the destructive social norm in India that justifies controlling behaviour as a demonstration of affection and care. If Kavita is a character that enforces gender stereotypes, Ananya is a character that breaks them. She is portrayed throughout the movie as a strong woman, who is expected to have a good career by her family and by everyone around her. Surprisingly for Indian cinema, on multiple occasions, the film shows her being unable to meet Krish because she is working in office or is on a business trip: something that the movie does not judge her for, and which is a storyline that is usually given to men. Ananya constantly challenges the patriarchal ideals of other characters, most notably in the memorable scene in which she confronts Duke, the groom at a wedding in Krish’s family for asking for a bigger car as his dowry. She deeply embarrasses him by asking him his salary and mentioning that she earns twice as much. She shows him that he could never afford to buy the car he wants from the bride’s family with his salary, and that if the marriage wasn’t arranged, he could never have gotten the bride to agree to marry him. On a related note, the character of Duke actually caricatures men somewhat. He is shown to be overweight, with a high voice and a childish manner of speaking, and the movie hints that this is related to his worth as a man. 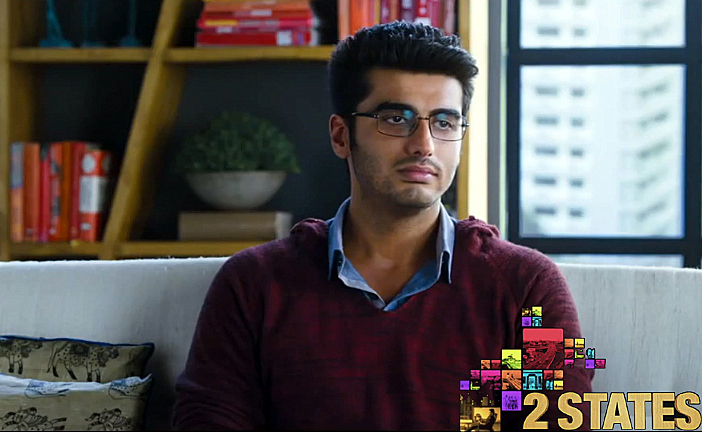 Another stark example of Ananya challenging gender stereotypes is her encounter with Krish. When she tells him she can’t cook, he looks shocked, so she asks him whether he can cook. He replies in a very obvious tone that he can’t, but that he is a man. Ananya sarcastically says remarks it’s a woman’s job to cook, and he agrees with her jokingly, after which she hits his arm and tells him she can’t do it. While she does end up cooking eventually, this dialogue is rare in popular films, challenging of the traditional gender role of women as cooks. When Krish asks Ananya if she is trying to ‘excite’ boys by wearing extremely short shorts, Ananya becomes impatient and tells him that she can’t help that. The effect of this liberal push-back is ruined somewhat in the next scene though, where she is shown wearing black clothes which cover her from head to toe for their study session because he got angry and walked off when she wore the shorts. Her character’s wardrobe is also fairly standard, though she does display more skin than Krish in certain scenes, when she wears off the shoulder or strapless clothing. In certain key scenes though, such as the first time the two of them kiss, she is wearing something completely normal and not at all revealing. However, the wardrobe choices in this movie in general do stick to the unwritten rule of fashion in Bollywood that men on formal occasions wear suits and western clothing, while women wear saris or Indian clothing. Unlike Ananya, one can see a tinge of sexism when it comes to Krish. He comments on how the worst thing about weddings is that it spoils all women moods at once. He also comments to the therapist when Ananya cuts her finger while cooking that it is the job of women to create melodrama, even though Ananya was not being all that dramatic, and was angry with him because he had forced her to lie about her cooking skills. However, there are some gender stereotypes that Krish doesn’t reinforce; for example, he takes it for granted that Ananya will have a career, and does not agree with his mother that the groom should not be picking up the bags of the bride’s family. The contradictory nature of the movie is further embodied in the fact that Ananya, despite being shown as a strong, intelligent woman, never seems to talk to anyone of her own age apart from Krish; she mentions during the course of the movie that she has no friends apart from him. Also, the movie seems to imply that Krish is more intelligent than her when he offers to give her lessons in economics and then scores higher than her on their test, even though she is a top economics graduate, and he is an engineer. Another interesting character is Krish’s therapist. The first female character to appear on screen, she is shown to be a doctor, which is a position of power. It is slightly odd, then, that the movie never names her directly, that she never speaks, and that the camera never focuses on her. We only see her indirectly. She does matter to the storyline, but is only a plot device for Krish to narrate to. One of the first shots in the shows her hand scribbling on a notepad, and later shots show us the back of her head, or a birds-eye view. This objectifies her, and makes her merely a prop in the telling of the story by the narrator. D espite having a strong female lead, the movie is not overtly female friendly. The female characters are all one dimensional, even to some extent Ananya. The male gaze runs through the film: even when Krish tells Ananya he loves her, it is not her intelligence, strength or courage that he references. Instead, he tells her that he has fallen for the mole on her left check, or that he cannot stop thinking about her. That the narrator of the movie is a man, and that the director, scriptwriters and producers are all men too, may be the reason for this lack of representation; women rarely ever seem to be at the center of stories that are written and made by men. Tagged 2 states, alia bhatt, arjun kapoor, Bollywood, chetan bhagat, dirty picture, Feminism, sexism, and trashy. Guys, seriously, Get A Life...And if you do have to blame, go blame Chetan Bhagat. It is a rip-off after all. How does one see the distinction in the two companies that the two leads interview for and later get placed also - Sunsilk (with shampoo bottles on the interview table) for the female lead and Yes Bank for the male lead. Isn't a certain gender stereotype visible there as well - a female not taking up a 'seemingly' serious financial sector job and male not going for the job of a marketting guy with sunsilk with a colourful vibrant office again with shampoo bottles all over! I don't know what the readings say of it. Thanks for pointing that out Chinmay. You're right, there does seem to be some gender stereotyping there. On the other hand, Ananya often has to travel for work and be away from hime while Krish doesn't, which doesn't really fit the conventional narratives on careers for the different genders. As we've commented in our review, this movie definitely has two sides to it! I didn't see the scene where she is covered in Black from head to toe as diluting the liberal push back. I saw it as a scene where Ananya goes to the other extreme of covering herself from head to toe as a way to show Krish how absurd he is being and therefore as a continuation of the push back.